Alectra Utilities - Y2.1 Yonge Street JUT - Phase 1E, 2E, 3E - Robert B. Somerville Co. Limited. Work under this contract included Installation of Joint Utility Trench comprising of Hydroelectric and Telecommunication ducts. 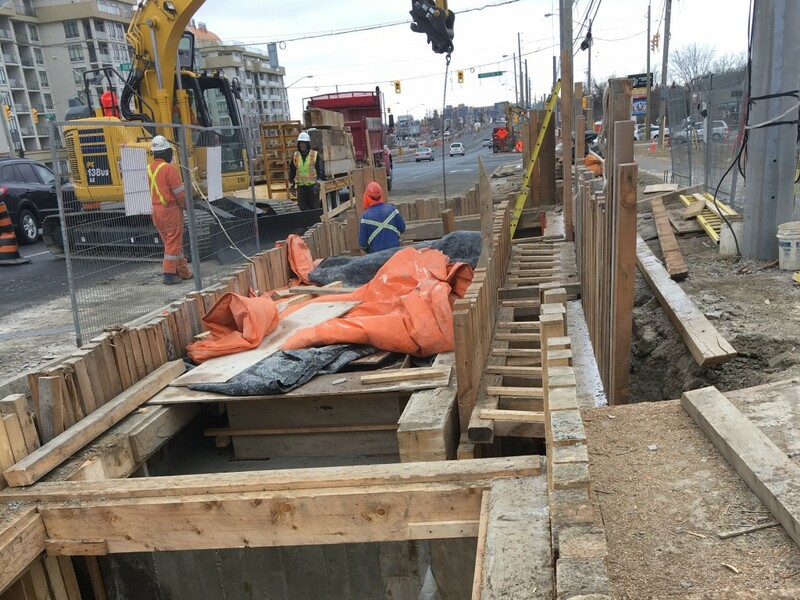 RBS was contracted by Alectra Utilities, Bell Canada and Rogers to install 2km of Joint utility trench on Yonge St., one of Canada’s longest, oldest and busiest roads in the Greater Toronto Area (Richmond Hill). The project limits were from High Tech Rd to 16th Ave. Throughout the project intense coordination was required with Alectra, Bell, Rogers, York Region, Town of Richmond Hill and private properties and Homeowners. The average trench depth of trenches on this project ranged from 3.5m to 4m and Hydro duct structures ranged from 12 ducts (4 wide x 3 high) to 20 ducts (4 wide x 5 high). There were 5 road crossings in the scope for which RBS successfully managed traffic during operations. Alectra scope included the installation of 10 Hydro MH (4.5m x1.2m), the relocation of 5 single phased transformers, cable recovery of 430m of 1000mcm (Primary) and 350mcm(Neutral), cable pulling in new duct structures approximately 9.5km of primary 1000mcm cable and 3.4km of Neutral 350mcm. RBS in coordination with Alectra completed all tie ins and cutovers. RBS also had to utilize a 750kVa generator to complete tie-ins during periodical outages. Bell and Rogers scope included – Installation of service ducts to 79 homes with Installation of Grade Level Boxes, Pedestals and core drilling ducts into existing Manholes. General work on this project included daylighting utilities, demolition of abandoned structures. RBS also had to breakout 100m of abandoned hydro structure. One of the highlights of the project was the installation of 2 Hydro MH side by side and the entry of ducts into the MH.